Several weeks ago, I bought a bunch of limes. I didn’t have anything specific in mind to make with them, but they were on sale, so why not get them, right? Then I went on vacation, came back, and sort of forgot about them until this past week when I thought I’d better do something with those limes! I love lemon curd, and for those of you who’ve tried my lemon tarts, you’ll agree it’s some pretty tasty stuff! 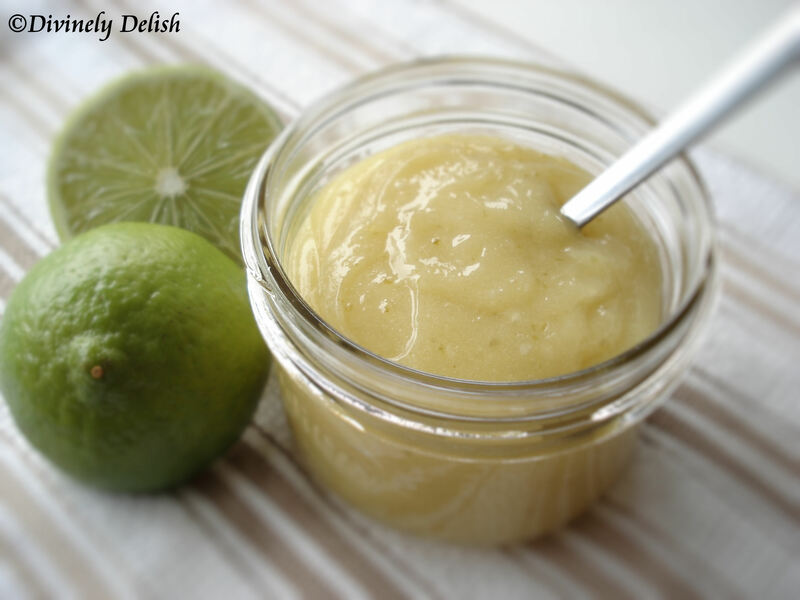 So, could I substitute limes for lemons and make a lime curd? I found this recipe, which is much simpler than the way I make my lemon curd, so I decided to give it a try. I used the juice of about seven limes, and the zest of one lime. Lime curd, like lemon curd, can be kept in the fridge for about one week (some say up to two weeks, but I’ve never tried that), and for up to two months in the freezer. Tip: Before squeezing for the juice, grate the zest from all the limes, and then put the leftover zest in a container in the freezer. I always do this with citrus fruits, because you just never know when you’re going to need some lemon or orange zest in a recipe. A great idea is to measure out spoonfuls of zest before freezing. 1) Place the sugar, butter, lime juice, lime zest in the top of a double boiler; stir over medium-high heat until butter melts. Mix 2 tablespoons hot lime mixture into the eggs and stir to blend. 2) Reduce heat to medium until water simmers. Slowly whisk egg mixture into the lime mixture. Cook over the double boiler until lime mixture thickens and coats the back of a wooden spoon, 20 to 25 minutes. Cool slightly and spoon into a clean, glass jar. Cover and refrigerate.